Collection of Season Words (kigo) for Haiku from the Indian Subcontinent. is a deciduous tree of the Phyllanthaceae family. It is known for its edible fruit of the same name. Ripening in autumn, the berries are harvested by hand after climbing to upper branches bearing the fruits. The taste of Indian gooseberry is sour, bitter and astringent, and it is quite fibrous. In India, it is common to eat gooseberries steeped in salt water and turmeric to make the sour fruits palatable. It is also used to straighten hair. Saint Adi Shankara composed and recited Kanakadhara stotram in praise of Goddess Mahalakshmi to make a poor Brahmin lady get wealth, for a single amla presented to him as Bhiksha by that lady on an auspicious Dwadashi day. AvvaiyarTamil: ஔவையார்), a female poet,ethicist and political activist of the Sangam period was gifted by one amla to her by King Athiyaman which will give her a long life. In traditional Indian medicine, dried and fresh fruits of the plant are used. All parts of the plant are used in various Ayurvedic/Unani medicine (Jawarish amla) herbal preparations, including the fruit, seed, leaves, root, bark and flowers. 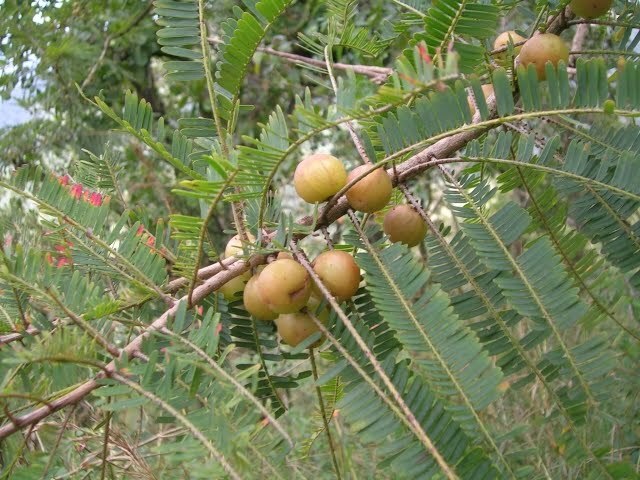 According to Ayurveda, aamla fruit is sour (amla) and astringent (kashaya) in taste (rasa), with sweet (madhura), bitter (tikta) and pungent (katu) secondary tastes (anurasas). Its qualities (gunas) are light (laghu) and dry (ruksha), the postdigestive effect (vipaka) is sweet (madhura), and its energy (virya) is to cooling (shita). ***** . WKD : Berry, berries . Submit your kigo or haiku HERE !
. . . ASK . . . any question about the WKD or Japan !